Today marks our baby's 15th day of life on this here Earth. For the most part it's been roses and rainbows, but the last four days were spent in the children's ICU hooked to oxygen and under the nurses' watchful eyes while a serious respiratory virus worked its way out of Charlie's system. And it did – we are finally all safe and sound, healthy and oh so happy to be home again. 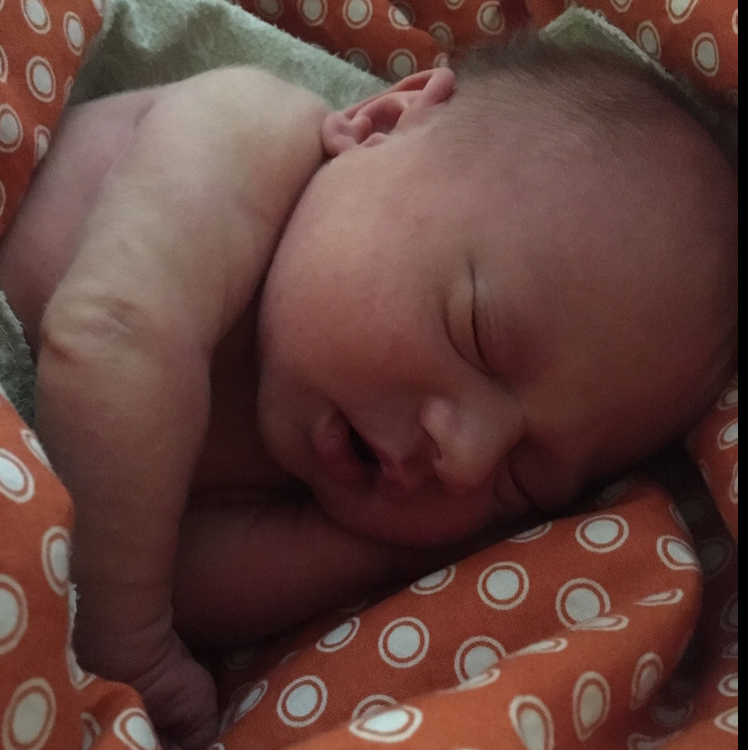 To take it back a couple weeks – Charlie was born on February 9th, at 10:37 AM, at home with my excellent midwife and her incredibly talented assistant. It was a beautiful, quick birth, with no complications, and Jon helped deliver the baby. Sam met his little brother just moments after the birth, after which he went on a well deserved "vacation" to his grandparents house half an hour away in Hudson. It was his first overnight trip without mom and dad, and apparently he enjoyed it so much that he decided to stay an extra day! He has been so steady through all this upheaval, but it will be good for all of us to find our new normal, our new rhythm. So now we settle back into the swing of things – next week welcomes March, which means we will be seeding onions and celeriac in our greenhouse on Wednesday. I look forward to the peace of germinating seedlings, and pray that we have fulfilled our share of unexpected "excitement" for the year. If you have recently tried to contact us by email, please send it again to make sure we don't miss it as we gather ourselves from the past weeks' upheavals. Please join today – visit our website for all the info. Your membership not only guarantees you a share of the summer and fall harvests; it also directly supports our farm and our family. Lineage Farm CSA Newsletter, Happy February! "January beats the drum. What is past, and what's to come?" 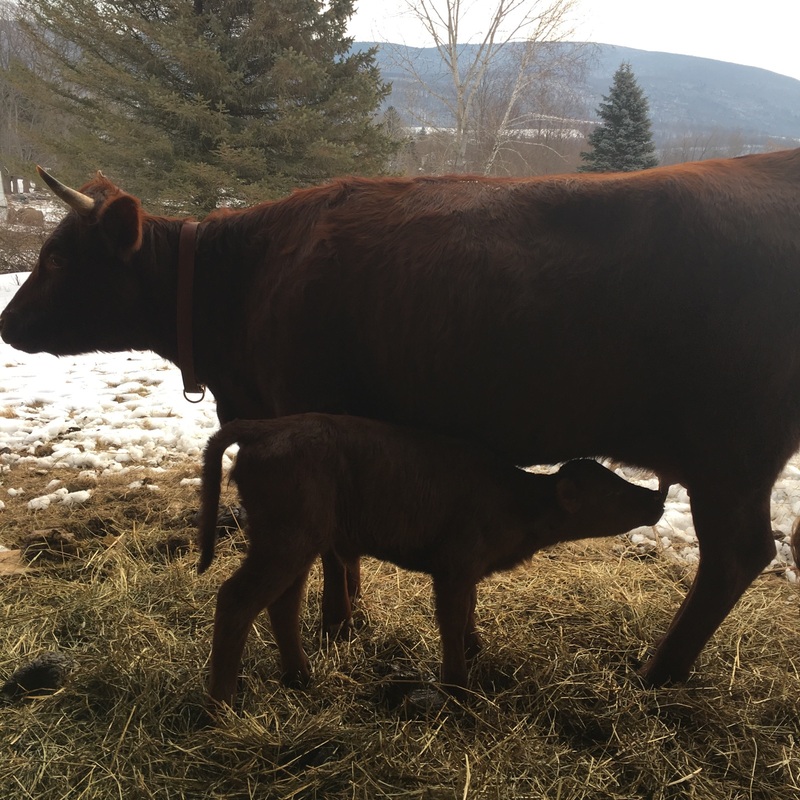 The end of January brought in a resonant, peaceful note – A week ago, we were graced with a new Farm Baby, our first calf! 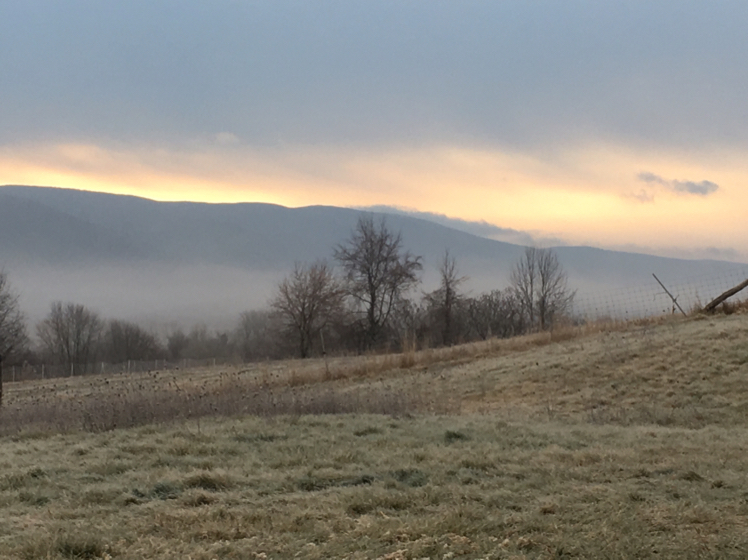 Last Thursday morning, as we sat at the breakfast table, and the sunlight softly suffused the valley and our hillside, we saw a small silhouette out in the winter cow pasture. Since that day, I've been blessed to enter the morning's chill with milk bucket in hand, to herd mama and baby into the cow shed for morning milking. The low-stress animal handling training I received at Spring Meadows Farm in Pennsylvania, where I worked with oxen, has come in incredibly handy – I seem to have retained far more than I realized! I can lead the calf on a halter after just a week of training, and Michelle (mama cow) moves easily and readily to her spot in the barn (we call it a barn for simplicity's sake, it's really a lovely semi-timber-framed three walled shed). As the sun peaks over the mountains and into the barn, Michelle and I talk softly to one another, and the soft hiss stream of milk flows from her udder. It's so incredibly warm against her flank as the sun shines in on us. And for some reason, kneeling at her side, the awkwardness of movement while 8 months pregnant falls away, and I feel strong, capable, and utterly balanced in a way that few positions allow these days! She hums the softest of comforts to her calf, who is tied just beside her in the barn, while I milk. We don't get so much milk, at least compared to farms that need to sell and so separate mama and baby overnight or completely; but we certainly get enough for us to drink, make yogurt, and enjoy the occasional farmer's cheese, which is just what we were hoping for! I'm also hoping to get more once they're on pasture, so we can make our own butter! Sam and I have been learning seasonal songs (thus the January quote above), and enjoying the company of other 2 and 3 year olds both in and out of doors. He also gets a kick out of bringing out his very own tool box and helping Jon fix and build things around the farm. Sign up sheets are finally updated on our CSA site form page (I just realized the other day the 2016 forms were still up for downloading! ), and of course you may join online anytime as well. Thank you to all of you who have already joined, truly supporting our winter work of planning and supplying our 2017 season! We are still looking for full time farm help this season, to begin work April 1st. If you happen to know anyone with a season or two of farm work under their belts, looking for a job, please send them our way! 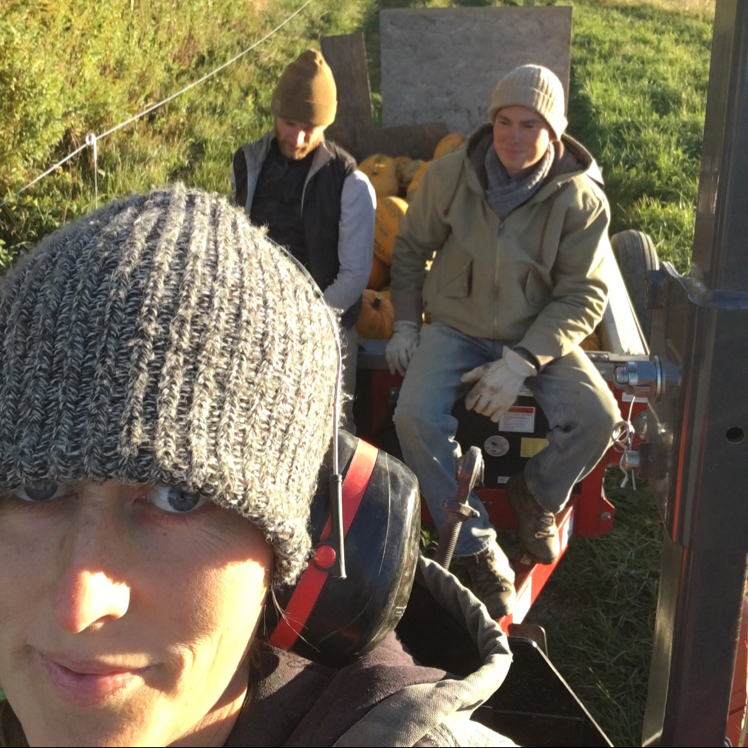 On a personal/political note – As the nation's turmoil threatens to increase, I find solace, strength and comfort in our community, our friends, our farm, and our actions. A verse from a 19th Century poet, (transcribed to music, and sung by a choir I've been part of off and on for the past several years) has come to mind over and again the last few months – "Though my soul may set in darkness, it will rise in perfect light. I have loved the stars too fondly to be fearful of the night." May our stars shine brightly, however dark is the night. May we support, encourage, protect and love our neighbors as we wish to be supported, encouraged, protected and loved ourselves. And may we remember that the stars continue to shine, even on the cloudiest of nights. Fwd: Lineage Farm News – 10 more days for Discount on Summer Shares! Lineage Farm News – 10 more days for Discount on Summer Shares! 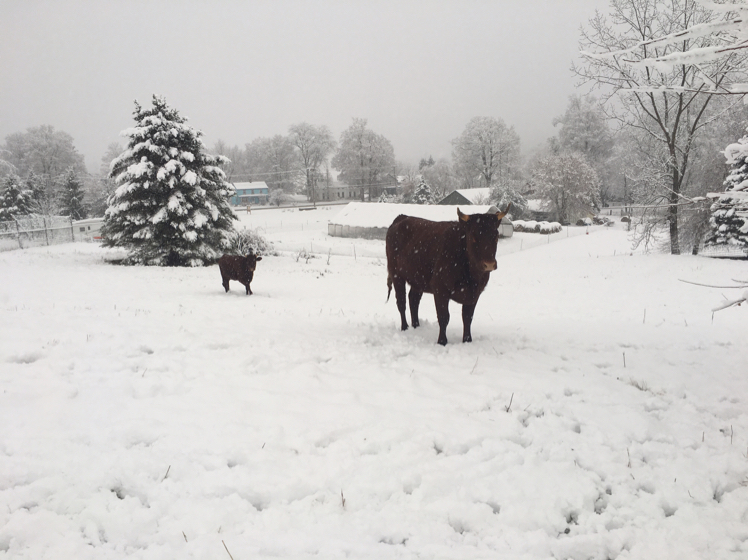 We are settling back in to the winter farm life after quite the holiday season. Jon, Sam and I took a train ride down to Virginia, where Sam got to spend time on the front porch swing talking with his 95 year old Great Grandmother. Sam loved the train, and I suspect it will provide good conversations with him for quite some time to come. It was so good to see family and to take our minds off the daily minutiae of mounting to-do lists. Perspective and distance gives a chance to recoup and take a look at the bigger picture, and I gotta say – I like what I see! I am getting very excited about the coming season on "the Flats;" I think it's just what our vegetables and our crew need this year. Applicants are coming in for the 2017 farm crew. We may have a returning crew member, Stas, who joined us part time right at the end and really helped us pull through the fall harvests. And we are ever so hopeful about the rest of this season's potential hire-ees as well. Planning is in full swing; I am focusing on the financial and budgeting aspects, which tell us so much about our business and yet can feel like a bit of a drag when I'd rather be out with Sam and Jon feeding the animals or finishing up that cow shed! 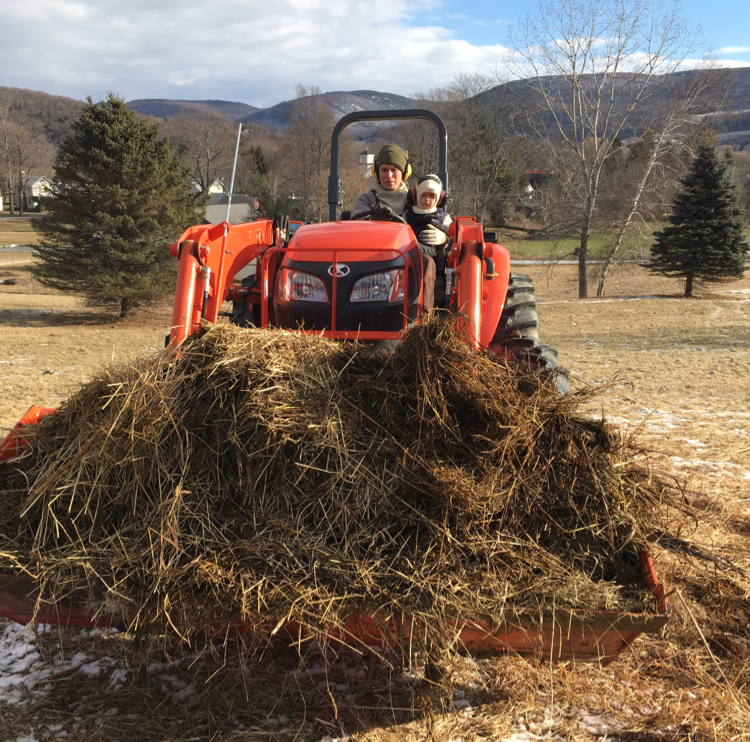 We had such a fun time New Years Day, shoveling the "poopy hay" into the tractor bucket and wagon to build this year's first compost pile. Sam is really growing into the farm chores these days – he can walk up and down the big hill helping feed out hay no problem, wields that shovel like a pro, and looks so grown up in his new snow pants I can't get over it. We visited some friends yesterday, who are starting a large garden for their new homestead. They grilled us on all things vegetable garden planning – how many carrot seeds per row foot for fresh carrots? And storage carrots? If we eat X cucumbers a day, how many plants should we plant and when? How many potato plants would give us 500 lbs of potatoes for fresh eating and storage? And varieties! It was a lot of fun sharing our knowledge (and they shared a really tasty cheese and fruit snack), and I am always so impressed with Jon's encyclopedic recall. I still look up yields/foot or acre, but he has all that and more right in his mental pocket. It also amped up my excitement for the spring and summer vegetables to come. Jon has been focusing on the crop planning and variety selections. He already put in our Fedco order, a great little seed company up in Maine that has a fun and quirky seed catalog. Other companies we enjoy, aside from the big reliables of High Mowing, Seedway, and Johnny's Seeds, are Hudson Valley Seed Library, Uprising Seeds, Fruition Seeds, Turtle Tree Seeds, Wild Garden Seeds, and Adaptive Seeds. The smaller companies tend to have the super tasty, more rare varieties. I love reading through Uprising Seed's tomato selection. We are going for a number of cherry tomatoes, a couple promising paste tomatoes, and some different (and some repeat) slicer tomatoes, and bringing up the total number of tomato plants, due to your feedback. The survey is still up, if you haven't had a chance to fill it out yet we'd appreciate it. We will try some Kabocha squash again, though for some reason that variety seems like a cucumber beetle magnet. Last year, we had a section of it in our winter squash field, surrounded by 3/4 of an acre of butternuts, Long Island cheese pumpkins, delicatas and acorn squash, and the cucumber beetles zeroed in so heavily on the Kabochas that the poor plants had no chance. Meanwhile the other varieties were barely touched! Maybe in a separate section from other squash, or with different fertility and weed management, or better irrigation…and so we try again! Reminder to sign up by January 15 for the last of the discounts for 2017 summer shares. The online code is discountdj, or just send in the paper form and payment (subtracting the appropriate amount) to po box 44, Copake NY 12516. Lineage Farm CSA – 12 hours left for the November-December discount ! Many thanks to everyone for your support this season, and to those who have already joined us for next season – Thank you! Tonight, the second round of discounted shares comes to a close. To join online, use coupon code DiscountND. Tomorrow and until January 15, use DiscountDJ for a slightly reduced share price. Paper forms can also be downloaded and mailed with a check from our website. We have stayed busy this month – the cow/sheep shed is nearly done, the chickens have a nice winter coop, and we have been catching up on various computer and office chores. We have enjoyed some glorious wintry days and look forward to many more while we cook up big plans for next season. We hope you will join us for the next round! And here is the survey! 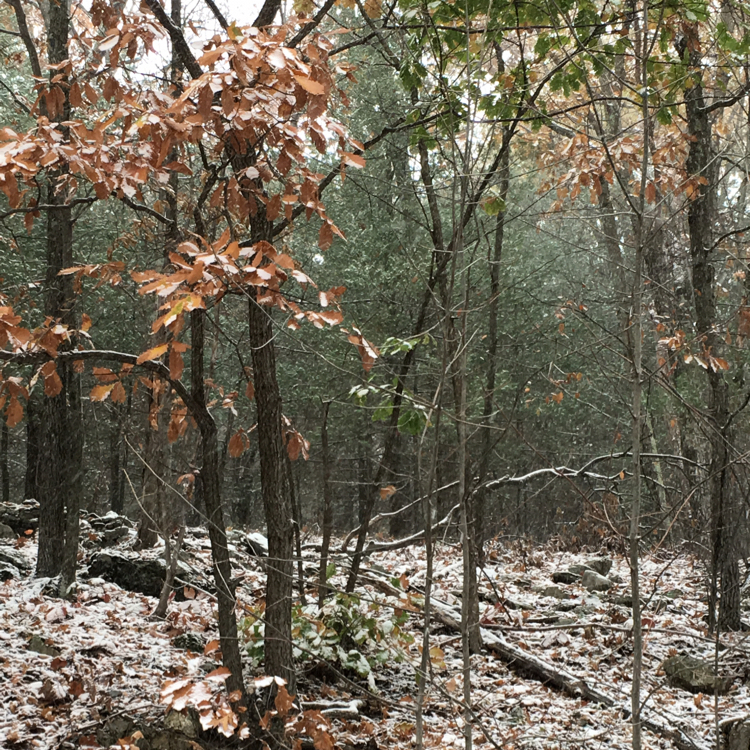 We have had a beautiful snowy week, settling in to life between growing seasons. Focus is turning to the future, as we start planning out next year's crops and field layout, the budget and new hires. Next season we are sub-leasing 10 flat acres of vegetable soil across the road, in the "Copake Flats," and are very excited that a deer fence already surrounds the property, and that there is a high volume well with a pump already installed just adjacent to our field. We are leasing this land to adapt to conditions found over on our side (low fertility and lack of adequate irrigation) and hopefully to avoid such things as massive cutworm attacks. The $20 discount continues for folks who purchase your 2017 CSA share between now and December 15. To attain said discount online please use coupon code discountND. We are sending out a survey later today. Please take the time to fill it out – rating the long list of veggies may take a few or 10 minutes, and will be extremely useful in determining our crop plan for next season. Newsletters may become even less frequent this winter, as we are expecting our second baby in late February. Please follow our adventures on Instagram @lineagefarm or on Facebook- there is a Lineage Farm CSA page but my phone posts our photos on my page, which I think is listed as Jennifer Carson. I may change it someday but can't say it's top on my list! So, enjoy your holiday weekend and we hope to see you again next Season! As we near the last deliveries, I hope that you have found satisfaction in your CSA shares, on your plates and in your bellies. Jon is concocting a survey to get your feedback on this season so that we may better plan next year's. Please keep an eye out for it! Sign up by November 15 for a chunky discount! Graduated discounts continue until January 15 2017. Poughkeepsie members must wait until your core group has convened in early November. Unfortunately we are unable to offer a winter share, or even bulk order boxes this year. Between the drought and having to build up soil fertility from highly degraded soils, the production yields on our storage crops were nearly half what we had planned for. Despite lack of farm help retention, Jon was able to get quite a bit planted, so you will continue to receive carrots, greens (I'm excited for the Bok Choi and parsley), squash and such from our garden, we just don't have the storage crops we have grown used to. Fingers crossed, and planning/planting more for next year! Did I mention how awesome the garlic planting party was? Lots of garlic for next year! Fall is truly and finally here! The maple tree at the foot of the hill is heavy with golden orange leaves, the mountain range across the valley is blooming with color, and the pepper plants just barely missed a good frost Monday night. Our handful of dahlias are toast, and I am very glad to have all of our winter squash out of the field and safely stored. 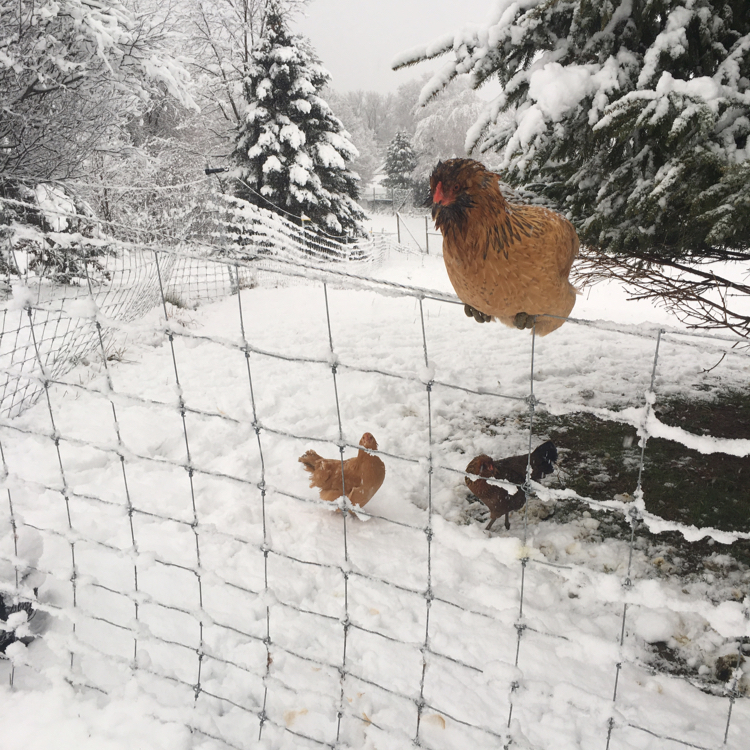 Bad news for all you egg fans – we were just notified that last Thursday's eggs are the last that Dogwood Farm can provide this season, as her hens' production dropped precipitously and unexpectedly. I have made calls to other egg farmers in the area, and no one has any to spare. Everything has its season, even eggs. 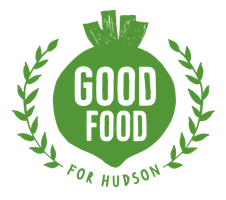 I can figure out refunds, or egg share members could also choose to donate the remainder to next season's Good Food for Hudson program. It was a joy harvesting this latest batch of carrots this morning, our first weed free patch of the year. Many thanks to everyone who made that possible! And many thanks too to Brooklyn member Kara, who joined us through two harvest days a few weeks back, and dove through those weeds to resurface with bunches of beets and carrots. So I hope you enjoy the butternuts, carrots, beets, onions, sweet peppers, arugula and more that we are bringing you this week, and for the next few weeks coming! Also, we are looking forward to seeing many of you this weekend! Saturday night may be a bit chilly with a low of 39, but if you like cool weather camping come on up. Sunday night sounds better, only down to 50, if you have the flexibility. And the potluck lunch starts Sunday at 12:30, followed by garlic planting! Our address is 1630 County Route 7a, Copake NY 12515. Google maps wants to take you around the corner to Empire Road at the last minute but don't let it! There is a big grassy front yard, a garage and two greenhouses, and a sign that reads "Copake Agricultural Center" and that is the driveway to enter.